The National Health Department is urgently trying to source and install a countrywide computer software system that will link healthcare facilities with drug depots and suppliers in order to relieve ongoing essential drugs stock-outs which threaten the lives of thousands of patients. The issue has become a national crisis, affecting districts in 8 of the 9 provinces. Contributing factors include a shortage of pharmacists, protracted labour disputes, dismal management, corruption, and woeful communication between suppliers, depots and facilities. Reports from HIV clinicians and fieldworkers, plus a collective probe by 4 influential NGOs, reveal that only adept clinical management of patients is preventing the emergence of widespread drug resistance and a rise in morbidity and mortality. According to the NGO report - compiled by the Rural Health Advocacy Project, Médecins Sans Frontières, the Treatment Action Campaign and +Section 27 - one of the worst examples is the Mthatha depot. In November last year the depot was described as 'anarchic and beyond redemption' by the then Eastern Cape Health Superintendent General, Dr Siva Pillay. This January, 24% of drug-prescribed patients were turned away from the 300 facilities the depot serves across 17 districts of the sprawling Oliver Tambo region, while 53% of the clinics and hospitals it serves suffered antiretroviral (ARV) or tuberculosis (TB) drug stock-outs, including shortages of the new fixed-dose combination (FDC) ARVs. These stock-outs lasted on average 45 days at a time and remained 'almost as common and severe as they were 5 months ago', according to the report. An estimated 100 000 patients depend on the Mthatha depot for their ARV drug supplies - giving some idea of the potential impact of similar dysfunctional facilities nationwide. The report found that the Eastern Cape Health Department's suspension of 29 depot staff late last year, without a plan to provide services in their absence, contributed significantly to the crisis. At the time of writing, the depot still had no full-time manager and was operating with half its usual number of staff. There were other reasons for the province's stock-out crisis. 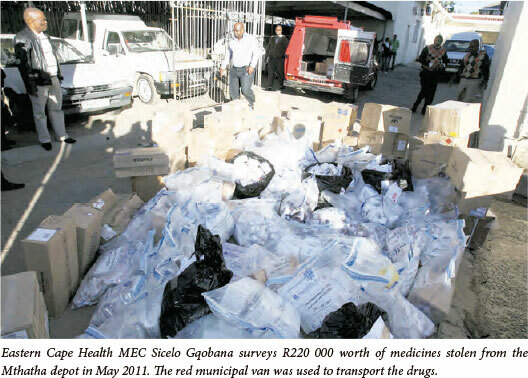 Between May and November 2011, 19 tons of medicines stored at the Mthatha and Port Elizabeth depots, plus the province's 92 healthcare facilities, were destroyed after being 'tampered with' or because they had passed their expiration dates. Earlier in 2011, 16 tons of medicines and surgical products were destroyed in a fire allegedly set at the Mthatha depot after Pillay ordered a sudden audit of the facility. In a 'sting' operation by the Hawks police unit, 3 health department pharmacy assistants and a municipal official were later arrested and a municipal vehicle impounded, in connection with the 'theft-for-sale' of an estimated R220 000-worth of medications from this and a nearby depot. According to documents in Izindaba's possession, the Mthatha depot issues a monthly average of R24 million worth of stock; however, from mid-September to December last year, it issued just R4 million worth. In a November 2012 report Pillay described the depot as 'unmanageable and unnecessary' because it was 'rife with corruption, widespread theft and labour problems'. He proposed bringing in the army to stem ongoing losses, which he estimated at R250 million a year, replacing the removed staff with temporary staff (to catch up on the month-long backlog), and then shutting the depot down entirely, moving operations to Port Elizabeth. In the long term, he proposed implementing, as a pilot project, the national health department's intended strategy of getting suppliers to deliver directly to healthcare facilities. His proposals were vetoed by his political superiors. The NGO probe found that, nationally, mismanagement exacerbated a chronic cycle of over-ordering by health facilities as the result of poor stock-keeping. In many cases, orders are radically out of step with actual need. The 'vicious cycle' is amplified by national drug shortages, leading to rationing of supplies to depots, which then adjust orders from facilities downwards. The probe also found that it's not only HIV and TB drugs running out across most provinces, but also a 'wide range' of essential medicines. Both large and small facilities are affected, with the latter particularly vulnerable as they are at the end of the supply-chain management line, and suffer from mistakes accumulated along the way. Lamivudine and tenofovir were the ARVs most frequently out-of-stock nationwide. The frequency of individual stock-out reports, combined with the assessment of those on the ground, suggest that Gauteng is also particularly badly affected, with patients reporting province-wide shortages of lamivudine and, to a lesser extent, tenofovir. Reports reaching the NGOs and other civil society organisations suggest that this is 'the tip of the iceberg,' because many stock-outs and their impact have gone unreported. In Ekurhuleni, at least 8 clinics were affected by lamivudine and tenofovir stock-outs. KwaZulu-Natal's Eshowe Hospital reported low supplies of tenofovir and 'indications of stock mismanagement' from the hospital to its surrounding clinics, which also reported FDC shortages and stock-outs of paediatric ARV dosages. In Limpopo, Messina Hospital ran short of tenofovir, lamivudine was out of stock at the province's main depot and stavudine was in short supply at several health facilities. The only province to escape mention in the damning report was the Western Cape. 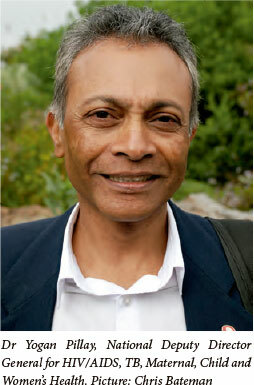 Confronted with drug shortage claims from HIV clinicians in Gauteng, and elsewhere, Dr Yogan Pillay, National Deputy Director General for HIV/AIDS, TB, Maternal, Child and Women's Health, accused facilities of 'hoarding' drugs. However, he admitted that his department does not know individual facilities' stock levels. 'Where there are facility stock-outs we look at who else has supplies. Often the depot has to look for stocks. From a national perspective we know exactly what's short, but we have no way of knowing what's happening at facilities. We also get figures from suppliers. Depot supplies we have a fix on, but facilities - zero,' he admitted. He said the department is trying to install a system that will link facilities' computer software with that of depots and suppliers to enable better management. Venter scoffed at this, saying 'We know exactly what to order.' He pointed out that the problem extends to the province and entire country. The HIV Clinicians Society recently drew up a drug substitution guideline list, but stock-outs leave diabetic or hypertensive patients instantly vulnerable. Venter said he believed the National Health Deparment 'has huge frustrations with the provinces - everyone at national [level] says this is indefensible. That's great, but it doesn't help! I think there's very limited accountability. Public sector salaries are good, so it's just not OK that systems are failing, or to whine about insufficient staff. We got this right with less staff and relatively less pay five years ago. Things were working. Twenty years ago things were working very well. It's got much worse.' 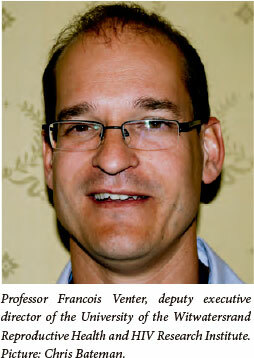 Venter said this is 'particularly sad' because the ARV programme has been 'such a massive success'. The report said that 'just months' after the national [priority-phased] roll-out of FDCs in April this year, shortages were already being reported. A major and unexpected cause was that manufacturers were producing below capacity because of 'machinery updates', and as a result some health facilities were getting very small quantities of FDCs, insufficient to meet the needs of the 'priority groups' (i.e. new ARV patients, HIV-positive pregnant women and 'triple-therapy stable' breastfeeding mothers). The report warned that as more patients became eligible for FDC, vigilance would be needed to ensure an adequate supply. South Africa, (DENOSA) reported that angry patients are labelling its members as 'uncaring professionals that deprive patients of medication', and called for the Public Protector to urgently probe the drug stock-outs. Gauteng provincial spokesman Chris Maxon blamed the shortage on 'supplier capacity challenges', while the province's Health MEC Hope Papo visited Daveyton clinics to check on reported improvements. Papo promised that 'in time', adherent patients who were in a stable condition would get 3-month supplies of drugs to minimise travel costs. The Mthata depot was described by Pillay in a November 2012 report, as 'unmanageable and unnecessary' because it was 'rife with corruption, widespread theft and labour problems'. He proposed bringing in the army to stem ongoing losses which he estimated at R250 million a year. The compilers of the NGO report confirmed that the national health department plans to implement direct deliveries to facilities, bypassing depots, with pilot projects underway in Limpopo and KwaZulu-Natal. However, they warned that this will probably only be practical for large deliveries. The department is also considering direct deliveries to the patients' homes or for collection in stores, with pilot projects planned next year. The collective report singled out the Eastern Cape health department for its harshest criticism, saying it seemed 'unable or unwilling,' to address drug supply problems in spite of knowing of them for several years, and having 'immense support' from civil society. It suggested that national health minister Dr Aaron Motsoaledi use his constitutional powers to intervene on an emergency basis to bring health services back in line with national standards.